SAGE India Digest: Caste, as it is experienced in everyday life! Caste, as it is experienced in everyday life! Let us begin with a story where a woman makes a strong gesture of anger against an old man who insists on knowing her caste before drinking the water she offers when he is thirsty. There are others in the compartment he does not ask for water for he knows their caste. When the old man almost chokes on a betel nut, one of the other passengers helps him out. He is a doctor. He tells the woman: Madam, you might feel compelled to show that you do not believe in caste. I don’t. Even though I don’t believe in it, it still stays sticking to me. I just have to keep dusting it away as I go. I should not allow it to make me, or the others who are close to me, lose self-respect. That is all I care about…. 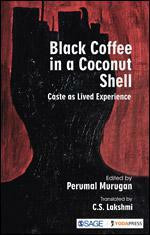 Caste, as it is experienced in everyday life, is the pièce de résistance of a recently published book by SAGE, ‘Black Coffee in a Coconut Shell’ that talks about living, loving and dying with caste as an indelible marker. Thirty-two voices in the book narrate how from childhood to adulthood, caste intruded upon their lives—food, clothes, games, gait, love, marriage and every aspect of one’s existence including death. Like the editor, Perumal Murugan says, caste is like the god, it is omnipresent. The essays in this book are not just sad stories about the oppression of caste; they are also about existing with caste and being inextricably caught in caste. There are times when caste protects you and gives you security in the form of a goddess or god that belongs only to you; it becomes a group solidarity you can fall back on even when it limits you in many ways and includes you and excludes you in specific ways. Caste is also a quietly sleeping demon within you which comes out and shocks you in the most unexpected moments when you use language you never thought you would. To read a book where Caste has been spoken about with such explicitness, you can buy your copy today.